Remodeling and revision and reinventing are themes in my life. If you’ve read my work you know that my formative years were spent in a house that was constantly in a state of remodel. You also know that in my novel Dove Creek, my protagonist meets a man in an antique store who owns a 2-story Victorian, also in a state of remodel. You also know that that fiction turned out to be prescient, since I later met and married a man who owned a 2-story Victorian, and, if you’ve read Blue Moon Vegetarian you know that we’ve been working at renovating it for 5 years now. And we aren’t close to being finished. If you’d been around for the writing of my MFA thesis, you’d know that I made my professors nervous because of the number of times I “started over” and that mere weeks before my defense, my major professor rejected what I thought was the final rendition of it, and that I spent 3 days in pajamas in my friend Helen’s basement eating chocolate before hauling myself off her flowered sofa to begin the quickest and most voluminous revision in the history of writing. And if you know me at all, you know how many times I’ve re-invented myself, how many times I’ve remarried, how many times I’ve been up and down the scale. 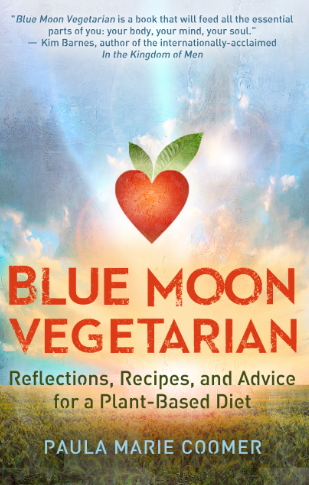 So, it should come as no surprise that the words “new cover” crept its way into my vocabulary a few months back, that my book manager and I came to the conclusion that in order to pave the way for a series of related books about food (more about that in the weeks to come), Blue Moon Vegetarian needed a new look. As excited as I was about the idea, I also had to mourn for a few days. It’s not often an author gets to work closely with a cover artist, but I did. I had lobbied the press to contract with an artist I knew and whose work I loved, Kelsey Grafton, for BMV’s original artwork. It was moody and beautiful, and I loved it. But I agreed the book’s new direction and the new series needed a different look. My subscribers got this information yesterday, and I meant to wait a few more days out of respect for them, but it’s the end of the semester, my schedule is crazy, and I knew if I didn’t do this today, I wouldn’t get to it until after grades are out. And so, I present to you this gorgeous new cover from Seattle’s Greg Simanson, who also did the artwork for Dove Creek and the 2nd edition of Summer of Government Cheese. One Response to "GREAT NEWS!"